It’s impossible to continue without firstly stating what we mean when we use terms like ‘data science’ and ‘artificial intelligence’. The latter in particular can often raise hairs on the back of naysayers’ necks (if you listen carefully you can probably hear a sensationalist journalist angrily booting up their laptop in your nearest coffee shop). Analytics has always informed what we do as a partnership. Any successful organisation will say the same. The best private and public sector organisations find the right blend of analytics, subject matter expertise, citizen engagement, ethnographic research, best practice reviews, and literature searches – Plus a dash of good story telling! It is this combination of approaches that return the greatest insight to inform decision making. In recent years data has become larger and more frequent. And the software, tools, and methods available to analyse data has become better. The practice of ‘data science’ has emerged and grown rapidly to fill this important need to analyse and interpret vast quantities of data. 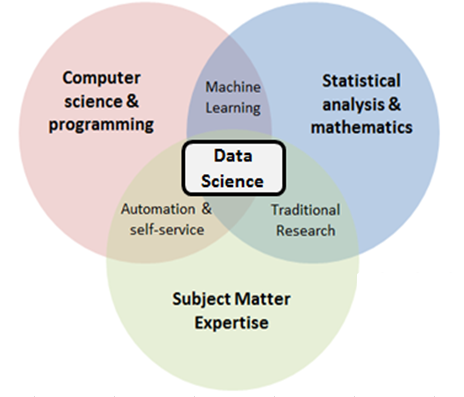 ‘Data Science’ itself is the combination of several key traditional analytical skillsets (eg, Statistical analysis and social science methodologies, plus domain expertise) complemented with Computer programming skills. Predictive analytics and artificial intelligence are phrases often used in the data science space. At this stage it is important to note that adding the word ‘predictive’ in front of the word ‘analytics’ doesn’t in anyway make the validity of the analysis less robust. In the same way ‘artificial’ intelligence isn’t automatically less reliable than ‘intelligence’. These are terms referring to the practice of extracting information from big data sets to determine patterns and predict future outcomes. It is impossible for a human to make observations on thousands (often hundreds of thousands) of records – so the process involves applying mathematical computational models to populations to generate ‘predictions’. Clear? Probably not! But no doubt this subject will come up again here – especially as we start to share more detail on our application of data science. It’s worth repeating that the intention of these models are never to replace human decision making, rather augment it. They are always used alongside a multitude of insight sources. To become ‘national leaders’ is more than simply knowing the methods and being able to execute them. Essex Partners want the analysis they undertake to lead to real positive action. Action that improves the lives of citizens and the services and experience they receive. The first phase of the project was a comprehensive diagnostic of the capabilities within the partnership (organisations involved in this stage included: Essex County Council; Essex Police; University of Essex). It’s important to understand our collective strengths and weaknesses, and the existing skills and experience available to us. To compliment this, a thorough best practice review was conducted looking at some of the excellent work that other public sector organisations have produced. There are some outstanding examples of using predictive analytics to improve lives and communities across local government and the public sector. This work gave us a clear view for where we are as an analytics workforce, and is helping create the vision for where we want to be (and how we will get there). To briefly expand upon these areas of development: Analysis is just a small part of data-driven projects. Translating insight and recommendations from analysis into something operational is critically important. The strength of the evidence is crucial to build confidence that the right action is being taken. And the continual evaluation of the impact of this action needs equal focus. We want to do this better. Likewise, we know we can be better at talking to people about how we use ‘their’ data to tackle issues important to ‘them’. Plus better at letting them know what we are doing and why. ‘How’ we will do this is something for another day/blog! Phase 2 in the Essex Innovates plan is now well underway. This includes the creation of an Essex Standard, including a robust governance framework and ethics board, plus consideration of how our work can become more transparent and accessible to the public.